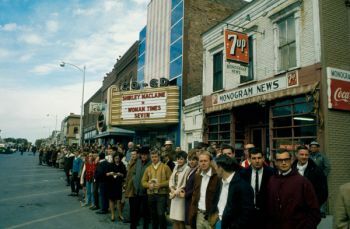 This 1967 photo shows University of South Dakota Students watching for the Dakota Days Parade in front of the old Co-Ed Theater (now Coyote Twin). The Coyote Twin theater today. As a University of South Dakota alumna, I have many fond memories of Vermillion’s little movie theaters, the Coyote Twin and the Vermillion Theater. My favorite is when my husband — then fiancé — and I decided to see a film after a huge blizzard. We first had to clear the driveway to our small trailer, and weren’t sure we’d make the start. Jeremy called the Vermillion Theater. “We’ll wait for you,” the employee assured him. True story. Maloney is now vice president of the non-profit VDCA. The group took ownership of the theaters in July and the Coyote Twin continues to operate. Through the support of The Vermillion Chamber and Development, USD and other local investors the building got a deep cleaning, new ice machine and a speaker to fix sound that was fuzzy for years. Digital ticketing replaces the former cash or check only policy. “Employees used to make change out of a cigar box,” Maloney told the 1 Million Cups audience with a smile. “They figured sales tax in their head.” Guests will soon purchase tickets on the Vermillion Theaters website and even bigger updates are planned for the future. “We are going to do some very significant physical restoration,” Maloney says. She shared a teaser of the architect’s plans for the Coyote Twin, with a total facelift to the building’s front. 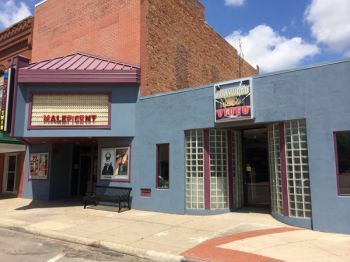 “What we’re trying to do is provide a cinematic opportunity with either classic films, film festivals, documentaries, that type of thing, in the Vermillion Theater and more traditional films in the twin theater,” Maloney explains. The group hosted their inaugural Friday Cult Classic, screening The Princess Bride the weekend of Aug. 7. Another is planned for the weekend of Sept. 11. Follow the Vermillion Theaters Facebook page and website for events, fundraising and updates on their progress. Awesome news! After spending the weekend in Vermillion recently to attend our high school reunion I was saddened by the look of the downtown area. Vermillion needs the theaters to bring people downtown!! Keep up the good work! I am a retired projectionist of 35 years. It is great to hear of people saving old theatres. The next time I am in South Dakota, my home state, I will come to Vermillion to see your theatres. A Call to Arts: Occupy Main Street!